Fri., Aug. 17, 2018, 11:44 p.m. 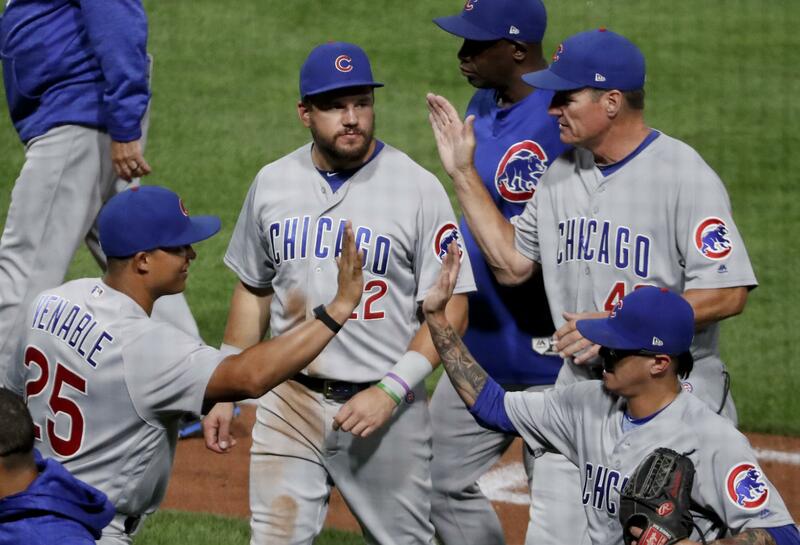 The Chicago Cubs tied a major league record by turning seven double plays Friday night, including a game-ending effort by rookie third baseman David Bote on a grounder by David Freese to finish off a 1-0 win over the Pittsburgh Pirates in Pittsburgh. The Cubs got six double plays on grounders – five with Cole Hamels pitching – and one on a line drive. The Elias Sports Bureau said the Cubs became the third team in big league history to turn seven DPs in a nine-inning game. Pittsburgh put runners on first and second in the ninth before Jesse Chavez got Freese to ground to Bote. Having hit a game-ending grand slam last Sunday night to beat Washington 4-3, Bote again was in the right place to cap off a win. Bote stepped on third and threw to first base to end it. Hamels (8-9) pitched seven solid innings. Kyle Schwarber hit a home run in the second off Trevor Williams (10-9). Chavez got his second save as the Pirates lost their fifth in a row. The Cubs beat the Pirates by a 1-0 score for the second straight game. ATHLETICS 4, ASTROS 3 (10): AT Oakland, California, Matt Olson hit a leadoff home run in the 10th inning after a video review gave Oakland the tying run in the ninth, and the Athletics beat Houston to pull within a game of the reigning World Series champs for the AL West lead. Olson pulled a 3-2 pitch from left-hander Tony Sipp (2-1) for his 23rd homer. It was his second career walkoff RBI and first game-ending homer. That came an inning after Oakland baserunner Ramon Laureano narrowly beat the tag at home from catcher Martin Maldonado for the tying run. Laureano took off from first on Nick Martini’s double to the wall in right field, testing the arms of outfielder Josh Reddick and relay man Carlos Correa. Laureano was initially called out on the play, but immediately called for Oakland to challenge the call. Umpires overturned the call after a review of more than three minutes. Blake Treinen (6-2) struck out the side in the 10th for the win. CARDINALS 5, BREWERS 2: At St. Louis, Kolten Wong and Marcell Ozuna drove in two runs apiece, Jack Flaherty pitched six shutout innings and St. Louis beat Milwaukee. The Cardinals won for the ninth time in 10 games and pulled within a half-game of the Brewers for the NL’s second wild-card spot. Milwaukee has dropped three of four. Flaherty (7-6) gave up three hits, walked three and struck out seven. The Brewers had only two runners reach second base against the rookie, who has allowed two earned runs in his past 19 innings pitched. Bud Norris earned his 24th save in 28 opportunities. Freddy Peralta (5-4) went six innings, giving up three earned runs. DODGERS 11, MARINERS 1: At Seattle, Manny Machado hit two of Los Angeles’ five home runs and Walker Buehler allowed one run in six innings in the win over Seattle. The Dodgers won consecutive games for just the third time since July 28, using the long ball to knock around Seattle starter Wade LeBlanc and for a night take the pressure off their shaky bullpen. Machado’s first homer led off the fourth inning and was his third since being acquired in a trade with Baltimore. He added a two-run shot in the seventh inning. Machado has 28 homers overall this season. LeBlanc (7-3) allowed seven runs, five earned, and lasted just 4 1/3 innings. Buehler (6-4) allowed just Ryon Healy’s home run leading off the fourth inning. The young right-hander struck out eight and gave up three hits. ROCKIES 11, BRAVES 5: At Atlanta, Ian Desmond tripled and drove in five runs, Kyle Freeland pitched six strong innings and Colorado beat Atlanta. The Rockies have won six of seven, and they’re 28-14 since June 28, tops in the NL over that span. And they’ve done it without the benefit of many blowouts: Friday’s game snapped a franchise-long, 25-game streak in which the Rockies scored six runs or fewer. Sean Newcomb (10-6) struggled for his second straight start as Atlanta’s NL East lead dropped to one-half game over Philadelphia. Colorado began the night 1 1/2 games out of the West lead. Freeland (11-7) gave up three hits and four walks and struck out four, improving to 5-1 with a 2.20 ERA over 12 starts since June 16. PHILLIES 4, METS 2: At Philadelphia, Aaron Nola struck out 11 in seven impressive innings to stay unbeaten at Citizens Bank Park, pitching Philadelphia past New York. Asdrubal Cabrera hit an RBI double off former teammate Noah Syndergaard during a three-run first inning, and Nola made the early lead stand up. Nola (14-3) allowed one run on three hits with one walk while lowering his ERA in 2.24. The All-Star is even better at home, improving to 9-0 with a 2.00 mark in 12 starts in Philadelphia this season. Pat Neshek pitched a scoreless ninth for his third save in as many chances. Syndergaard (8-3) allowed four runs on eight hits with five strikeouts and two walks in 5 2/3 innings. YANKEES 7, BLUE JAYS 5 (7): At New York, Neil Walker hit a three-run homer, Giancarlo Stanton added an impressive opposite-field blast and New York rallied for a rain-shortened victory over Toronto. Stanton hit his 31st homer of the season into a party deck behind the home bullpen in the bottom of the seventh, and a batter later, umpires pulled the teams off the field amid rain at Yankee Stadium. The game was called with one out in the seventh after a delay of 1 hour, 25 minutes. Chad Green (6-2) pitched two scoreless innings for the win. In a scoring oddity, David Robertson got his third save despite not recording the final out of the game. Rookie Gleyber Torres drove in the go-ahead run with a fielder’s choice off Joe Biagini (1-7) in the fifth. Toronto jumped on starter Lance Lynn for four runs in the first inning. NATIONALS 8, MARLINS 2: At Washington, Max Scherzer pitched six scoreless innings for his major league-leading 16th win, and Ryan Zimmerman and Matt Wieters homered as Washington beat Miami. After throwing seven shutout innings against the Cubs Sunday only to watch Chicago win on a walk-off grand slam, Scherzer (16-5) left with a 5-0 lead and watched as the Nationals thwarted a Marlins rally. Scherzer allowed at least one baserunner in four of six innings but worked out of trouble as Washington opened a six-game homestand with little margin for error as it seeks to get back into playoff contention. Bryce Harper and Adam Eaton had three hits each for Washington, which has won two straight after losing seven of its previous nine. Austin Dean homered for his first career hit for the Marlins, who have lost six straight. Miami’s Dan Straily (4-6) allowed five runs on nine hits in six innings. RED SOX 7, RAYS 3: At Boston, Xander Bogaerts hit a two-run triple and added a pair of doubles, and Boston scored seven straight runs after allowing three in the first to beat Tampa Bay. Jackie Bradley Jr. had two hits, including an RBI double in the sixth, and the Red Sox improved on the best record in the majors with their 87th victory. Brian Johnson recovered after getting roughed up in the first with three runs on four hits and a walk. Johnson (4-3) didn’t allow another run and pitched 5 2/3 innings before leaving after Joey Wendle’s two-out double in the sixth – Tampa Bay’s first hit since the first inning. REDS 2, GIANTS 1 (11): At Cincinnati, Phillip Ervin led off the 11th inning with a home run over the center field fence, lifting Cincinnati over San Francisco. Ervin’s third homer of the season and first career walk-off drive came on a 1-1 pitch from Ray Black (2-2). David Hernandez (5-0) struck out two in a perfect 11th inning as the Reds ended a four-game losing streak. Scooter Gennett had three hits for the Reds. Andrew McCutchen had three of San Francisco’s eight hits. Cincinnati starter Anthony DeSclafani pitched a season-high 7 2/3 innings, giving up six hits and one run with one walk and five strikeouts. He retired 11 consecutive batters from the fifth into the eighth. Casey Kelly, making his 10th major league start and first since May 22, 2016, for Atlanta, pitched around giving up nine hits and a walk to allow just one run in 4 1/3 innings. INDIANS 2, ORIOLES 1: At Cleveland, Carlos Carrasco pitched seven scoreless innings and moved into a tie for the AL lead with his 15th win, Jose Ramirez hit his 37th home run and Cleveland beat Baltimore. Carrasco (15-6) allowed three hits, struck out six and retired his final 10 hitters. Ramirez’s first-inning homer tied him with Boston’s J.D. Martinez, who entered Friday with the major league lead. Cleveland has won six straight and is a season-high 19 games over .500 (70-51). David Hess (2-7) allowed two runs in six innings for the Orioles. Trey Mancinci’s RBI single in the eighth scored the only run for Baltimore, which has lost 11 of 13. Cody Allen walked Renato Nunez with one out in the ninth. Pinch-runner Craig Gentry stole second before Tim Beckham flied out. Allen struck Joey Rickard for his 24th save in 27 chances. TWINS 5, TIGERS 4: At Minneapolis, Pinch-hitter Joe Mauer hit a go-ahead, three-run homer in the seventh inning, and Minnesota beat Detroit. Eddie Rosario and Tyler Austin added solo home runs for Minnesota, which finally broke through against Detroit starter Matt Boyd to win its fourth straight game. Kyle Gibson (7-9) allowed three runs and eight hits and struck out five in seven innings for the Twins. Taylor Rogers earned his first major league save by striking out Jeimer Candelario with two runners on in the ninth. Boyd (7-11) beat Minnesota on Sunday and had not allowed a hit over the previous nine innings until Austin singled to start the fifth on Friday. Boyd stranded Austin, but the Twins finally broke through an inning later. Rosario homered to break the scoreless streak against Boyd. Austin started a four-run seventh with his second home run in five games for Minnesota, a towering shot that reached the second deck in left-center field. RANGERS 6, ANGELS 4: At Arlington, Texas, Rougned Odor drove in three runs with a single and a sacrifice fly, Joey Gallo ripped a two-run double and Texas beat pitching-depleted Los Angeles. Odor’s two-run single capped a five-run outburst in the second inning off recently acquired Odrisamer Despaigne (2-1), the 14th starting pitcher used by the Angels this season. Drew Hutchison (2-2) struck out six and allowed two runs over five innings in his third start for the Rangers. Jose Leclerc struck out the side in the ninth for his fourth save. Gallo’s double into the right-field corner made it 2-0 before he scored on a groundout by Isiah Kiner-Falefa. Odor’s two-run single was the fourth consecutive Rangers hit after that, and he added a sac fly in the seventh inning. DIAMONDBACKS 9, PADRES 4: At San Diego, Paul Goldschmidt hit a two-run home run, Steven Souza Jr. drove in three and Arizona beat San Diego. Goldschmidt drove the first pitch he saw from left-hander Joey Lucchesi (6-7) out to left-center field for his 28th of the season. That got Arizona going en route to its sixth straight win over San Diego at Petco Park. Souza doubled into the right-center gap with the bases loaded to bring home three runs in the sixth and extend the lead to 8-3. Robbie Ray started for Arizona and walked his first two batters. While Ray held San Diego to two hits, both by Eric Hosmer, he allowed three runs over 4 2/3 innings. Ray walked five and struck out three. WHITE SOX 9, ROYALS 3: At Chicago, Jose Abreu and Nicky Delmonico hit three-run homers in a seven-run, seventh-inning outburst, lifting Chicago past Kansas City. Delmonico went 2 for 4 and had a career-high five RBIs. Tim Anderson went 3 for 3 with a walk and two stolen bases for Chicago, which has won eight of 14. Abreu’s homer was his 22nd. The White Sox have homered in a season-high nine straight games, totaling 13 during that stretch. James Shields (5-14) allowed three runs on six hits in seven innings to snap a five-start winless streak. Yoan Moncada started the rally in the seventh with a walk. Yolmer Sanchez then followed with a slow grounder to shortstop that Alcides Escobar booted for an error – snapping the Royals’ 16-game errorless streak. Right-hander Jason Adam came on to replace Tim Hill (1-4) and Abreu hit the first pitch into the left-center bleachers to give the White Sox a 5-3 lead. Published: Aug. 17, 2018, 11:44 p.m.